A small compact character area, in modern Pembrokeshire, on the southeast flank of Mynydd Preseli. It lay within the medieval Cantref Cemaes which was brought under Anglo-Norman control by the Fitzmartins in c.1100. The Fitzmartins retained it, as the Barony of Cemaes, until 1326 when they were succeeded by the Audleys. The Barony was conterminous with the later Hundred of Cemais, which was created in 1536, but many feudal rights and obligations persisted, some until as late as 1922. 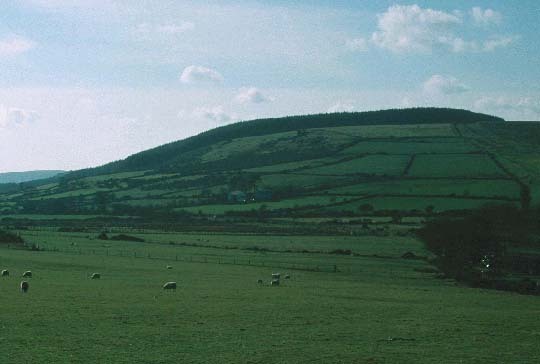 Like most of the southeastern part of the Barony within Mynydd Preseli, the Llethr area continued to be held under Welsh systems of tenure. In 1118 William Fitzmartin granted this area, as part of the grange of Nigra Grangia, to the Tironians of St Dogmaels Abbey. Its assessment at only half a knight's fee suggests that the grange was probably mainly unenclosed moorland pasture during the medieval period. At the Dissolution, it was acquired by John Bradshaw of Presteigne, along with St Dogmaels Abbey, and was thereafter held distinct from the Barony of Cemaes. This character area exhibits a very distinctive, regular enclosure pattern and probably represents late enclosure of former moorland pasture, possibly as late as the 18th- early 19th-century. Charles Hassall's record, in 1794, of the 'extensive waste' persisting in Mynachlog-ddu is reproduced in the County History. In the 16th century, the parishioners of Monington, on the north coast of Pembrokeshire near St Dogmaels, claimed exclusive rights of common to 'certain lands called Llethr' in Mynachlog-ddu parish. 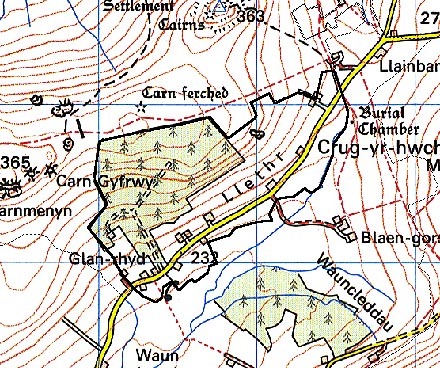 This may be referring to the Llethr area which contains 6 'llethr' farm names - Llethrmawr, Llethr-uchaf, Llethr-ganol etc. A direct reference to such distant transhumance is unusual within southwest Wales, and appears to be a continuation of a situation practised under St Dogmaels Abbey. The area may have been enclosed when those grazing rights ceased, or the grazing rights ceased when the land was enclosed. The process of enclosure was complete by the time of the tithe survey of 1846, when the Llethr farmsteads were under the common ownership of a Jane Harries. There are also some later agricultural holdings which may have originated as squatter settlements. The northern half of the area was planted with forestry in the mid 20th-century. Llethr historic landscape character area lies on the southeast flank of Mynydd Preseli between 250m and 340m. It is enclosed into small, irregular fields by dry-stone walls, with occasional stony banks. The dry-stone walls are mostly in good condition, but some are starting to deteriorate. Many examples of foundation stones and boulders could be termed monoliths. Hedges that formerly topped the stony banks are now almost entirely reduced to lines of straggling bushes; wire fences now run along the crests of the banks. Farmland land-use is improved pasture, with very little rough grazing and no arable. The settlement pattern is one of dispersed farms and cottages. Dwellings are almost entirely 19th century, in the vernacular style, and are generally stone-built with slate roofs, one, one-and-a-half or two storey, and 3-bays, cement rendered or bare stone. Most are modernised. Agricultural buildings are small, reflecting the size of the holdings. The most common styles are: a single small, stone-built 19th century range; mid 20th-century corrugated-iron barns and other structures; and several small late 20th-century steel-, concrete- and asbestos-built structures. There are no listed buildings within the area. A late 20th-century coniferous plantation lies over the higher slopes of this character area. Much of this plantation was established over abandoned fields, farms and cottages, but part of it was planted on the unenclosed moorland of Mynydd Preseli - this has been included in this character area. Apart from the coniferous plantation, the only trees lie close to the dwellings to provide shelter, and on the banks alongside lanes. The lanes and tracks of this area are narrow and winding and flanked by high banks. Recorded archaeology is limited to two possible clearance cairns and two possible standing stones, all characteristic of the bronze age. Llethr is a very distinctive historic landscape character area. It is the only location close to Mynydd Preseli where dry-stone walls are the main boundary type. To the north and west open moorland of Mynydd Preseli forms a hard-edged border to this area, as does unenclosed marsh and rough grazing to the south and southeast. Only to the east against Mynachlog-ddu character area is there a zone of transition rather than a clearly defined boundary.